His portrayal of US President Jed Bartlet in NBC's The West Wing, has made Martin Sheen one of America's most respected actors. But, in real life, he says his high-profile anti-war stance has resulted in hate-mail and calls for him to be sacked from his television role. Ever since President George W Bush asked the American people "Are you with us or against us?" in the war against terrorism - to which he has linked Iraq - the political atmosphere in the United States has been highly charged. "We are telling the world that we are patriotic Americans but we do not support going to war with Iraq," Sheen told an audience recently. His Hollywood union, the Screen Actors Guild, has expressed concern that certain of its members holding "unacceptable" views might be punished by losing their right to work. It recalls, it says, the days of the McCarthy witch-hunts of the 1950s when so-called Communists were blacklisted. It's ironic that the guild itself was responsible for much of that blacklisting in Hollywood. Giants such as Charlie Chaplin, Orson Welles, Paul Robeson, Arthur Miller and Joseph Losey were among the hundreds denied work. It's ironic, too, that the president of the guild at that time was none other than Ronald Reagan who, as we know, went on to attain the office Martin Sheen is portraying in The West Wing. "Given that several musicians at the recent Grammy Awards reported receiving requests NOT to talk about the war during the telecast, I think the Screen Actors Guild is justified in being concerned," Tom Cole, arts editor of US National Public Radio, told BBC News Online. "McCarthy is riding again," declares Glenda Jackson, Oscar-winning actress turned Labour Party member of parliament. She told BBC News Online: "Television in America is not just about programmes, it's about the products they sell. TV executives will be pressured by the advertisers given that the majority opinion in America is pro-war." Martin Sheen's President Bartlet is far removed from George W Bush. Bartlet is liberal, idealistic, intellectual and charismatic. He changed his name to Martin Sheen to avoid being typecast in ethnic roles. All his four children were to become actors. Emilio, Ramon and Estelle kept the Estevez name; only Charlie retained his father's stage alias. How did Joseph Conrad's Heart of Darkness influence the 1979 war movie Apocalypse Now? Martin Sheen's big break came in 1974. The man who was to champion peace made his name playing a violent killer in the highly-rated Badlands. His performance led to Francis Ford Coppola handing him the part of Captain Willard in the Vietnam epic, Apocalypse Now. It was a near-disaster. The shooting took nearly seven months in a hostile Philippines swamp. Sheen was drinking heavily, and, eventually, had a heart attack. He was 36. 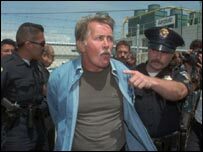 Soon afterwards, Martin Sheen signed up to Alcoholics Anonymous, and channelled his energies into political activism. He was greatly inspired by Cesar Chavez, the leader of the United Farm Workers' Union in California, whom he joined on many acts of civil disobedience. He credits a meeting with Mother Teresa in Rome, in 1991, as the catalyst for his re-adoption of the Catholic faith. "I'm not interested in religion per se," he said, "I'm interested in spirituality, truth and in my humanity, and I find that in the Christian community." Martin Sheen's popularity as an actor, together with his genuine commitment to social causes, makes him the ideal celebrity to raise the anti-war profile. His aura of political authority has transposed itself from the small screen to real life. "To a little old lady living in a small mid-western town, who's uncomfortable with the prospect of war but who feels that she's the only one with those views, to hear someone like Martin Sheen is reaffirming," says Glenda Jackson. "It makes her feel less vulnerable." 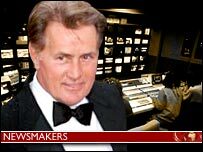 Unlike Jackson, Martin Sheen is not interested in party politics. "I certainly don't have the kind of intelligence or the make-up to be a real president", he said recently. 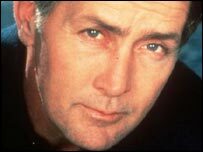 While President Bartlet often agonises over the difficult decisions involving the fate of America, Martin Sheen has fewer doubts as to where his personal convictions lie.